Le Club AccorHotels has launched its popular breakfast inclusive 40% off (30% off for non-member) Super Sale for stays November 1 – April 30, 2016, and the booking is now live as well (make sure that you have your member number when doing the property/price search). The valid booking dates are from October 5 to 16 depending on your affiliation with Le Club AccorHotels. Remember that Super Sale reservations are prepaid, non-refundable and non-cancelable. You should ONLY book them when your plans are firm. The Le Club AccorHotels tend to have their lowest prices during these Super Sales IF you can commit to a non-cancelable reservation this long before. The price for the Caesar Park in Rio de Janeiro is quite attractive during this sale. – Between 9 and 16 October 2015, for AccorHotels brands newsletter subscribers, and for AccorHotels and Le Club AccorHotels partner subscribers. – Between 12 and 16 October 2015, , for the general public. – All above dates are inclusive and based on local time of the hotel on which room(s) are being booked. 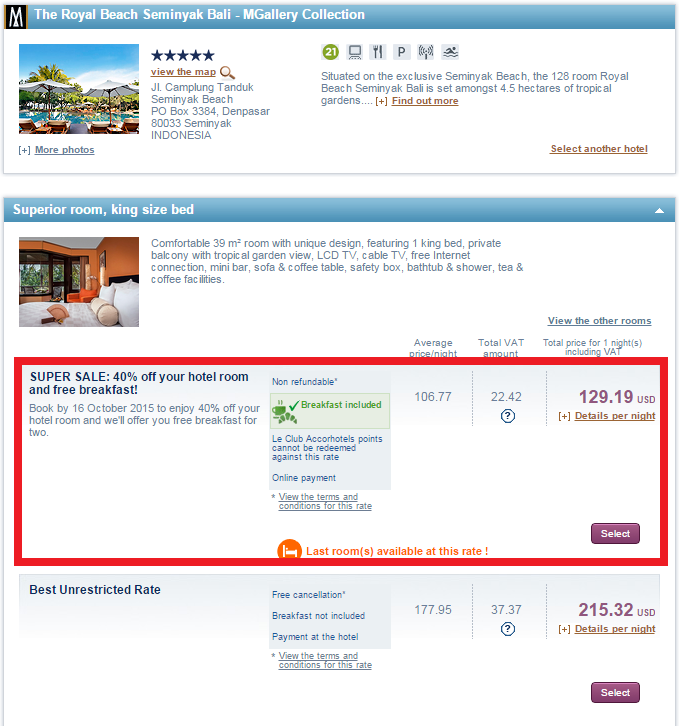 – Booking must be prepaid online at www.AccorHotels.com or on sites belonging to AccorHotels Group brands. This offer applies to all stays between the 1st November 2015 until the 30 April 2016 at participating hotels (both dates inclusive and based on local time of the hotel at which room(s) are being booked). – The 40% discount on room + free breakfast for two is granted to Accor Plus and Le Club AccorHotels members (except for Adagio and ibis, all Seasons Bali Legian, Cairns Harbour Lights, Grand Mercure the Vintage AVC, The Sebel Flinders Lane, The Sebel Creswick Forest Resort, The Sebel Busselton, The Sebel Swan Valley The Vines, The Sebel Palm Cove Coral Coast, The Sebel Mandurah and The Sebel East Perth which offer this discount without free breakfast). It applies to public rates without conditions for the dates requested at booking. – The 30% discount on room + free breakfast for two is granted to non-members of Le Club AccorHotels (except for Adagio, ibis, ibis budget brands, all Seasons Bali Legian, Cairns Harbour Lights, Grand Mercure the Vintage AVC, The Sebel Flinders Lane, The Sebel Creswick Forest Resort, The Sebel Busselton, The Sebel Swan Valley The Vines, The Sebel Palm Cove Coral Coast, The Sebel Mandurah and The Sebel East Perth, which offer this discount without free breakfast). This offer is subject to the condition that the customer has a customer account on one of the AccorHotels Group sites (it is possible to create this account with a first reservation on an AccorHotels Group site – customer account creation is free of charge). The discount applies to public rates without conditions for the dates requested at booking. All Seasons Bali Legian, Cairns Harbour Lights, Grand Mercure the Vintage AVC, The Sebel Flinders Lane, The Sebel Creswick Forest Resort, The Sebel Busselton, The Sebel Swan Valley The Vines, The Sebel Palm Cove Coral Coast, The Sebel Mandurah and The Sebel East Perth do not offer free breakfast. – The ibis budget brand only allows a discount of 30% for Accor Plus members, Le Club AccorHotels members and the general public. – Prices displayed are for single or double rooms per night. These prices are in local currency or US dollar currency (as stipulated at the time of booking) and are inclusive of all local taxes unless otherwise stipulated. Exchange rates are given for information purposes only and are non-binding. Currency applicable to the transaction and charged to your credit card are confirmed upon booking. – Le Club AccorHotels point bonuses will be credited in accordance with the Le Club AccorHotels general terms and conditions. Next articleBeware Of Your Inflight Meals – Light Snack In Between Or Disguised ‘Calorie Bombs’ ?